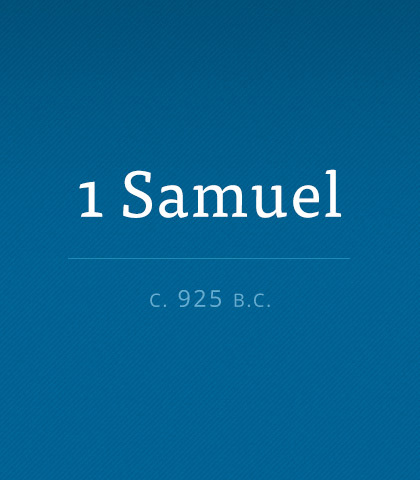 First Samuel chronicles the beginning of Israel’s monarchy, following the lives of the prophet Samuel, King Saul, and King David. Read more about the book of First Samuel. Transition times can be disconcerting. Those who have gone through the remodeling of a home can testify to that! Likewise, changes in leadership at one’s place of employment or moves across the country or new policies and procedures set in motion bring the need to adapt. Being creatures of habit, we are disturbed by these changes. The boy Samuel heard God’s voice in the middle of the night. Have you ever wondered why God spoke to him? Or what God said that night? The scene may be familiar, but what it represents is not. It is a message as relevant today as it was when the Lord first spoke it. Discover from the tragic life of one of the Bible's greatest examples of failed potential just what it means when we don't take God seriously. It’s one thing to be apathetic towards people. We’re often indifferent to politics and social justice—trusting others to take care and do what’s right. As serious as apathy is, apathy towards God is even more critical. When we open our hearts to God He replaces apathy with passion... and that’s when our lives are changed. When Saul became king, he was “little in his own eyes” (see 1 Sam. 15:17), but some time later all that changed drastically. The erosion of his character left him proud, impatient, and downright rebellious…a man who refused to bow even to the Lord his God. A serious failure and well worth our attention. We tend to think of teens as the only ones who deal with rebellion and defiance but these tendencies are in all of us, no matter our age. Let’s remember that God has set the authorities in place. Rebellion against earthly authorities amounts to rebellion against God, which is the most serious revolt of all. There are times when defending one’s rights is essential; to do less would result in chaos. However, we are not addressing those issues in this message, but rather the sin of standing in stubborn defiance against and questioning any and all authority that has the right to confront, correct, or instruct us. Because human depravity runs deep, it is impossible to rear our children from infancy to independence without encountering times that call for straight talk and tough love. While parents continue to love their children no matter what, they cannot escape those occasions when wills clash, rebellion reaches an impasse, and things get downright impossible. The result? Harsh words and ugly reactions as parents stand their ground and sons and daughters react in stubborn defiance, refusing to back down. This is one of those times when the fun stops for parents. Every family has headaches and heartaches. Because human depravity runs deep, it is impossible to rear our children from infancy to independence without encountering times that call for straight talk and tough love. While we love our children no matter what, parents cannot escape those occasions when wills clash, rebellion reaches an impasse, and things get downright impossible.